Don’t you just love how being in Vegas feels? The classiness of the people, the atmosphere of the casinos, the feel of the games and even the smell of the place. 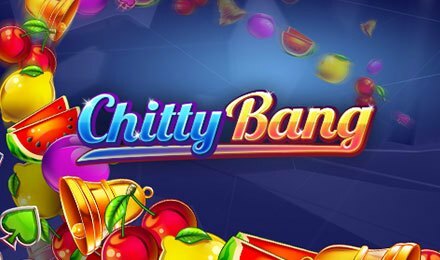 Pariplay brings Las Vegas to you on Chitty Bang slots. Enjoy the settings of the game, which is classy and mysterious offering a great and smooth gameplay. On the reels, find symbols like; Watermelons, Cherries, Lemons, Lucky 7, Stars, Bells, Plums, Clubs, Hearts, Spades and Diamonds. These symbols will land on the reels to form winning combinations and trigger prizes. Set your stakes on the Bet Field, using the + or – buttons. After doing that, you can start spinning the reels. Autoplay is at hand, and allows you to select 5 to 50 auto spins to put to play. The most rewarding symbol is the Diamond, which also acts as the wild symbol. This replaces all other symbols bar the scatter icon. For a 3, 4 or 5 symbol combinations, 2x, 3x or 8x your stake is awarded. The scatter is the Bang symbol, which triggers the bonus round of the game. On reels 1, 2 and 3, some symbols light up. If all nine positions are lit, a respin is awarded. Reels 1, 2 and 3 on that spin feature 3x3 symbols, and guarantees a massive win! Land three, four or five scatter symbols anywhere on the reels to trigger the Free Spins. Get your hands on 8, 12 or 40 free spins when three, four or five symbols show up. During the feature, reels 4 and 5 merge to act as 2x2 symbols.